I began the week with a very old Tomintoul. 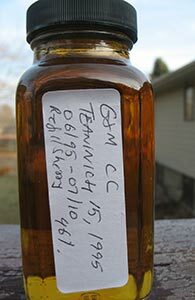 Let’s close it out as well with a very old whisky, albeit not quite as old. Like Tomintoul, Teaninich is not a storied distillery, which explains why this one was also quite reasonably priced on release. Of course, since this was bottled by the boutique Malts of Scotland it cost almost as much at 39 years old as that 45 year old from the far less-heralded Chester Whisky. It’s not just the marketers at the corporations that own distilleries that indulge in premiumization, you see. 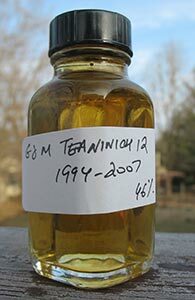 This is my second review of a G&M release of Teaninich. I thought the first, a 12 yo from 1994, was fine but somewhat pedestrian. This one, a 15 yo from 1995, is from a reference sample of a bottle I finished a while ago and I liked it a lot while it was on the go. I’m interested to see how it holds up. As always, even though this review is being posted a week or more after the first this was tasted alongside its younger sibling. Nose: Rich sherry and polished oak. Orange peel and raisins and light notes of chocolate. A little leatheriness here too but not bitter as in the 12 yo. With more time there’s some plum jam and a touch of lemon. The fruit intensifies with time. A drop of water ties everything together wonderfully and brings a nice earthiness to ground the fruit. Palate: Very much as on the nose, but as with the 12 yo, there’s more bright citrus here. There’s wood here too but it’s not tannic or bitter at all. The secondary fruit here is more apricot than plum. A little more salt with time and the wood gets a little more pronounced too. Water makes it spicier (cloves). Finish: Long. Bright and lemony, turning malty. Gets a little more bitter (cold black tea) as it goes. Water drives the bitterness away. Comments: This was a rather active refill sherry cask. Now this one I would have liked to have tried at cask strength. Still, very good as is. And if Gordon & Macphail have casks this good lying around surely Diageo must have some too. I predict (not that this is particularly bold) that we will soon see a Teaninich in the annual releases. Teaninich is another of the many Scottish distilleries that produce malt largely for blends. Indeed, there are only 12 official releases listed on Whiskybase and most of those are from the extinct Rare Malts series. It’s not shown up yet in Diageo’s Annual Releases either. And so it is to the indies we must look yet again to find Teaninich, and who better than Gordon & Macphail who seem to have large stocks of everything. I will be reviewing another G&M Teaninich early next month. Nose: Malty, slightly spirity and generic but pleasant sherried notes: dusty caramel, light mocha. Toasted wood emerges as well, and it gets a little bit grassy with time. With more time and water there’s some citrus and honey and the wood gets a tad more polished than toasted. Faint hints of some musky fruit too (or am I imagining this?). Palate: Very much as on the nose at first but then there’s a burst of citrus–orange peel at first but it gets brighter quite fast. Some salt and a little bit of woody bite (some cinnamon in there too). Somewhat thin mouthfeel. Gets quite salty on the second sip. With more sips there’s an increasing leafy quality and more leathery bitterness. Finish: Medium. It’s the citrus, salt and wood, in order of increasing intensity that make the most impact at the end. Leaves a bitter taste on the sides of my tongue. Water didn’t do much for/to the palate or finish. Comments: Perfectly pleasant but completely undistinguished sherried whisky. But there’s nothing wrong with that–at the right price this would be good everyday whisky. Would it have been much better at cask strength? Maybe the citrus would have been more pronounced on the nose and richer on the palate, but then maybe the woody/leafy/bitter notes would have been far more pronounced too. As it is, even at 46% it’s better with water.